BBC journalist Neil Nunes, centre, contributes to a panel discussion on “The Phenomenon of Fake News” on day two or University of the Southern Caribbean’s Freedom, Facts & Fake News: Straddling Media Communications in the 21st Century conference at the Radisson Hotel in Port of Spain, last Wednesday. Professional excellence. 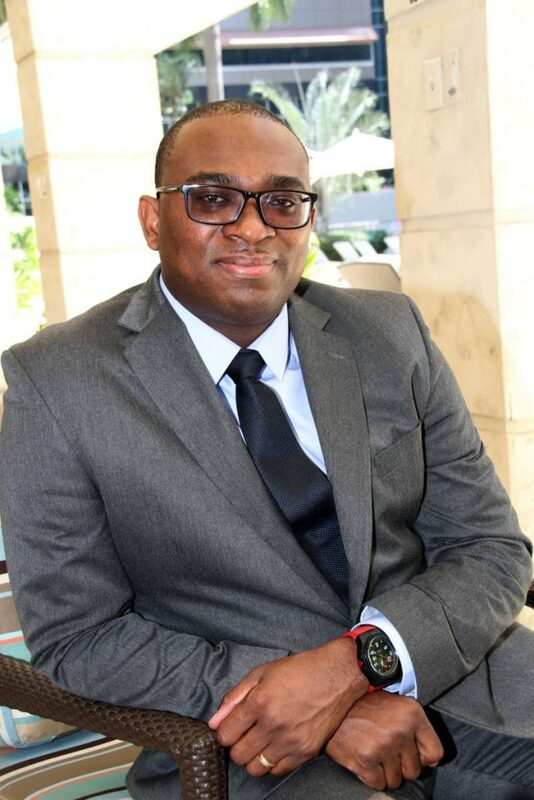 It seems a simple concept, obvious even, and it’s what Jamaican-born British Broadcasting Corporation (BBC) senior announcer, Neil Nunes, believes is the first line of defence for an industry battling the scourge of fake news. “One of the things I will stress is just doing our job the way we ought to – with rigorous editorial integrity. We would not deliberately do fake news, but let’s root out the inaccuracies in our reporting. Let’s make sure stories aren’t one-sided. 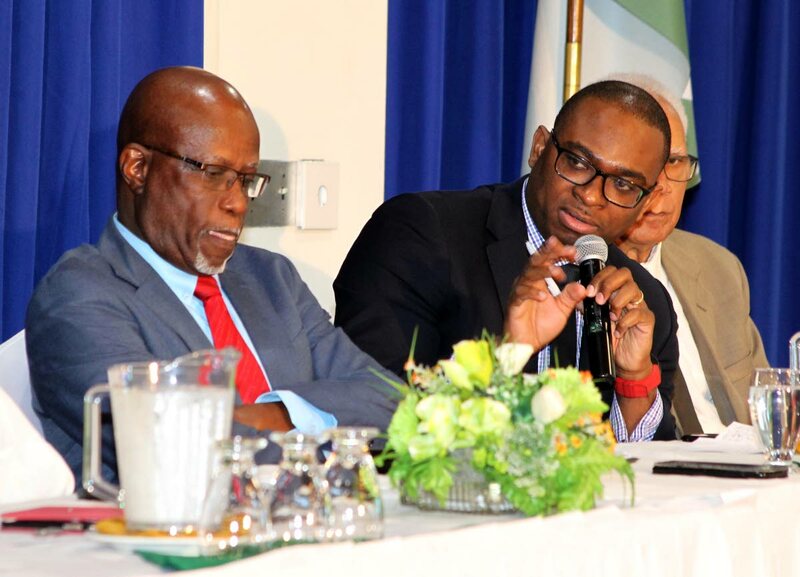 So that when we do our work, people might not agree with it but they can say it’s an authoritative account and that we are credible in our reporting,” Nunes told Sunday Newsday in an interview earlier this week at the Radission Hotel in Port of Spain. Nunes was the feature speaker at a fake news forum hosted by the University of the Southern Caribbean (USC) last Tuesday and Wednesday. Fake news is the deliberate and often malicious attempt to spread misinformation under the guise of journalism. There’s an implicit trust in the news media, and purveyors of fake news latch on to that. He said it was unhealthy and dangerous for the media to be the constant source of criticism because it undermined trust in the media, and trust was the glue that held society together. And there’s already a level of distrust in the media. A joint Gallup/Knight Foundation poll released in September last year found that over the last decade, 69 per cent of American adults reported that their trust in the media decreased. Globally, Chicago-based global marketing firm Edelman’s 2019 Trust Report shows that while trust in the media has increased by three points from last year, it’s still below the half-way mark, at 47 per cent. In Trinidad, for example, politicians have begun taking a cue from US President Donald Trump, who has popularised the term “fake news,” especially when referring to media reports that might be deemed unflattering. At the opening ceremony of the fake news conference on Tuesday, Communications Minister Stuart Young, who frequently uses the term in his media briefings, brought up the concept again in his opening remarks, chastising reporters for not fact-checking information and instead relying on social media, suggesting media’s “agenda” was to create panic and insecurity. Jones P Madeira, Newsday editorial consultant, delivers opening remarks to start the panel discussion on “The Phenomenon of Fake News,” alongside, from left, Andy Johnson, head of news at Power 102FM; Judy Raymond editor in chief at Newsday; Nicole Duke-Westfield, president of the Public Relations Association of TT; Julien Rogers, managing editor at Guardian Media Ltd; and Neil Nunes, BBC broadcast journalist, at day two of University of the Southern Caribbean’s Freedom Facts & Fake News: Straddling Media Communications in the 21st Century conference at the Radisson Hotel in Port of Spain, last Wednesday. 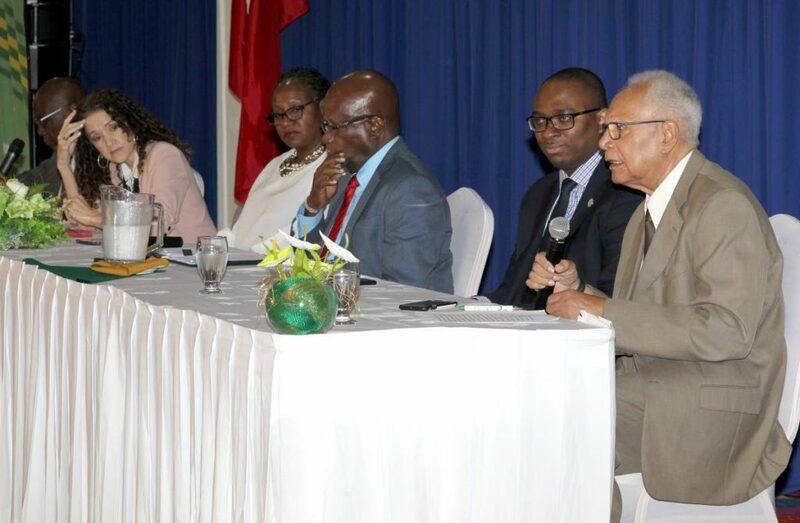 Veteran journalist Dr Sheila Rampersad responded to Young, noting the difference between inaccuracy and fake news, countering his arguments about agendas, while pointing out the challenges that local media face when trying to report, including law suits and character-smearing. Nunes, in his interview, acknowledged that fake news had found a reliable vehicle on social media, even though social media companies have now begun taking steps to mitigate the effects, albeit belatedly. Cambridge Analytica’s use of Facebook, allegedly in attempts to influence elections in the US, and before that, in TT, have been well-publicised, and Facebook has recently taken steps to delete at least 800 fake news accounts from its platform. But, just like journalists need to have some kind of professional responsibility, Nunes suggests consumers should also have personal responsibility. And, he added, perhaps mainstream media might need to have an educational component to help users spot fake news. Nunes acknowledged that the current state of the media industry globally has had an impact on resources but, despite the cost cuts and higher workloads and the low wages in the industry, “Professional excellence does not come with a price tag. There is a multicplicity of challenges in the industry, he said, and several major companies have had to cut staff – just two weeks ago, major US digital media outlets Buzzfeed and HuffPost, as well as Gannett media, collectively let go 1,000 employees. Journalists also have to resist pressures that come with regulations that can border on censorship, and the attending pressures some may face because of their subject matter and focus. There’s also information overload, where, in a world where news is shared in 240 characters or less, consumers just don’t pay attention to serious, nutrient-rich long-form reporting. And no matter how good local media are, the competition now isn’t just domestic or even regional, but international. “We have to find ways, not to jazz up our stories, but to tell them in ways that are compelling. It’s going to take great, world-class writing. Excellence is how we fight off fake news. Excellence, not just being good, not just being fine. Excellence is how we secure our future. And part of that excellence is continuing to push the envelope so that we are attractive but credible and methodical,” Nunes said. Reply to "Media excellence can fight fake news"